Huntington, MA (July 12, 2018) – A serious crash on Route 112 in Huntington left two people injured Wednesday evening. Just before 8:00 pm, a pickup truck was traveling on 112, near mile marker 6 when the driver lost control. 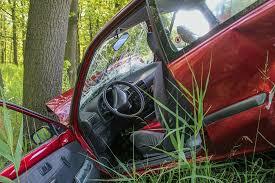 The car left the roadway, went through a guardrail, and crashed into a set of trees. Massachusetts State Police responded to the crash. State Police Sgt. Paul Sullivan said that the driver was pinned in the vehicle and that his passenger, a woman, also suffered injuries in the crash. Both the male driver and female passenger were extricated from the truck and rushed to a local hospital with undisclosed injuries. There is no word on the extent or severity of their injuries at this time. The Massachusetts State Police are working with an accident reconstruction team in order to determine what may have caused the crash. There is no further information available at this time.